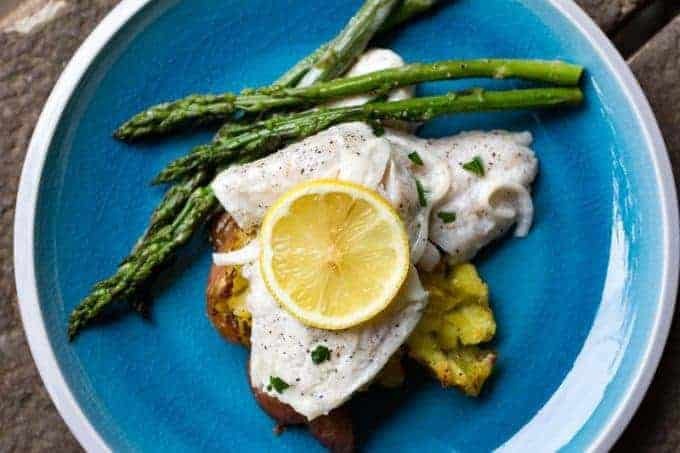 Grilled Traeger Walleye with Lemon Cream Sauce is probably the best fish I’ve ever eaten. And I LOVE fish and seafood. This stuff is like, magic. If you aren’t lucky enough to be able to get your hands on fresh walleye, you can use any mild-flavored white fish. Walleye might be my favorite fish to eat, fresh or saltwater. 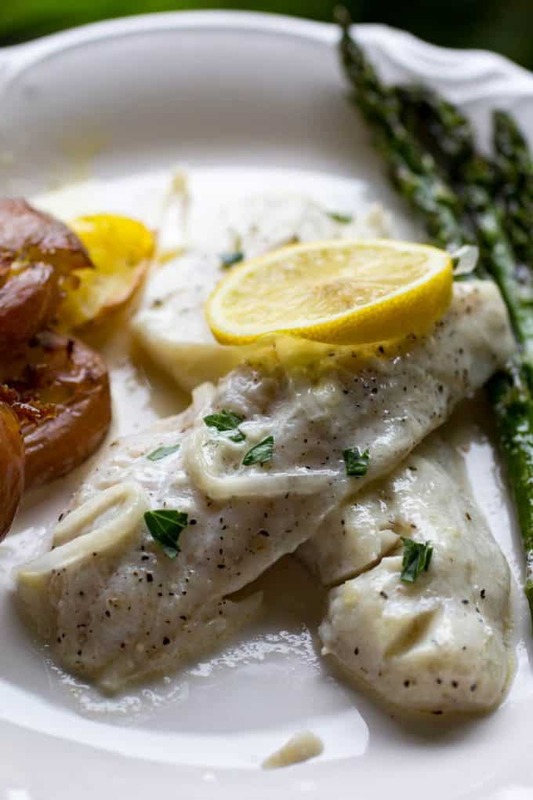 Don’t worry if you can’t get your hands on any fresh walleye fillets. 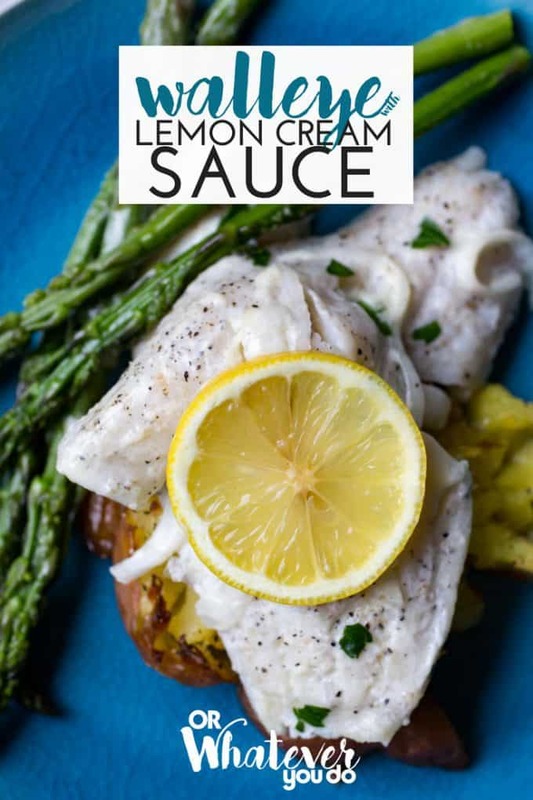 This lemon butter cream sauce will work perfectly on any white fish. You can use it on Walleye, Crappie, or Perch from a lake or river, to Cod, Rockfish or Halibut from the sea. Try it on your favorite fish. These are just a few of ours. 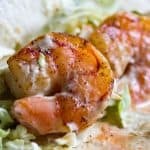 After the fish, you probably only need to run to the store for a couple other ingredients. 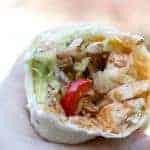 This is a very easy recipe to follow and prep + cook time is only 30- 35 minutes combined. Grilling fish can be tricky sometimes, but if you follow my easy tips it’ll make things go smoothly. 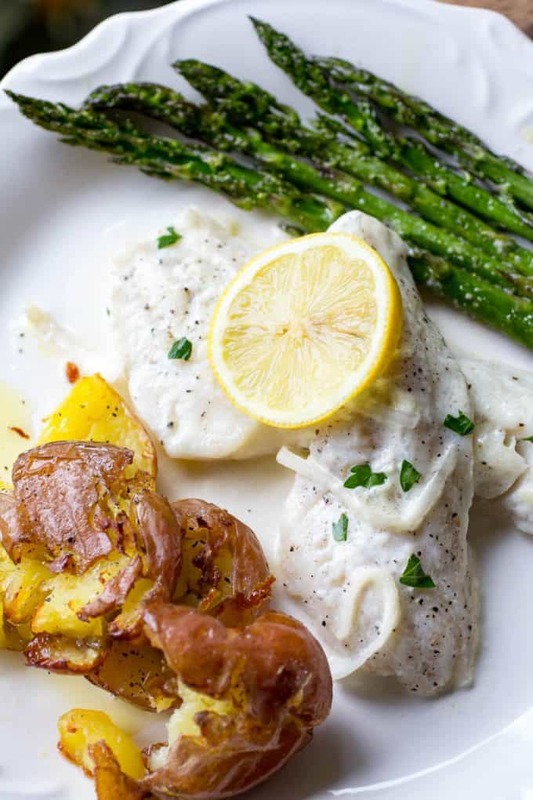 Skin-on fish can go right on the grate, but skinless filets need a more delicate touch, so make sure to cook those in a baking dish or on a sheet of non-stick foil. Speaking of sticking, if you do grill on the grate, non-stick GRILL SPRAY is your friend! 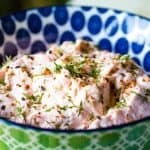 Whitefish is fragile and generally has a really mild flavor. Cooking it at high temps on your wood-pellet grill will only kiss the fish with smoke and not overwhelm it. 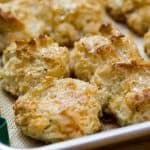 This recipe is made in a 9×9 oven-proof dish. Speaking of the oven – you could totally make this in the oven if you don’t have a grill handy, or if your grill doesn’t have such great temperature controls. 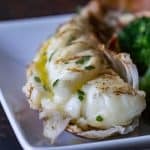 WHAT CAN I SUBSTITUTE FOR THE HEAVY CREAM? Please please please do NOT try to sub in any lower-fat dairy for the heavy cream. Lower-fat dairy has a higher risk of “breaking” under high heat. Do NOT use half and half or milk or anything crazy like that. Just use the cream. It is well worth the extra calories. ALL THE THINGS. 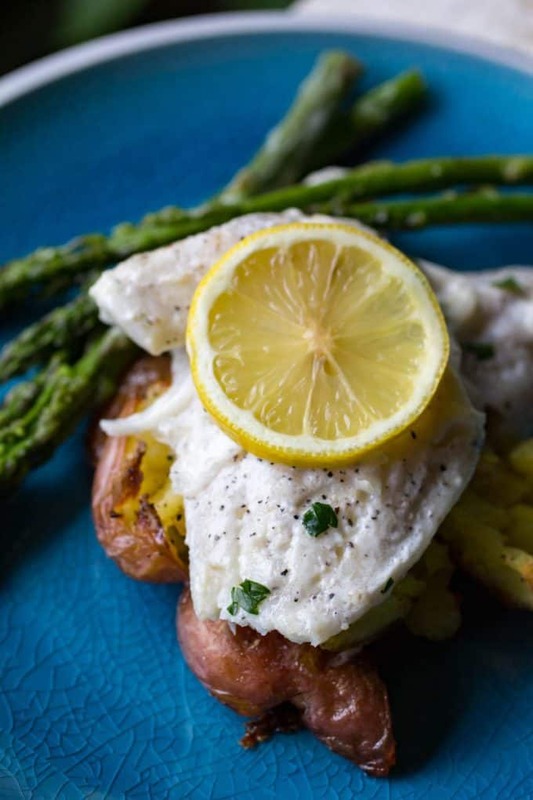 Pictured in these photos you see our uber-popular Perfect Grilled Asparagus. Another great option would be this Instant Pot Basmati Rice! 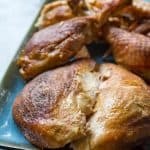 If you’ve got some non-fish eaters around, check out my whole collection of Traeger Recipes for more ideas! 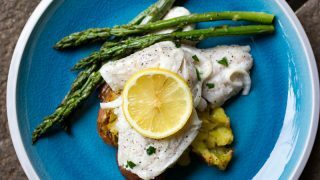 Delicious flaky walleye grilled on the Traeger with an easy and bright lemon cream sauce! 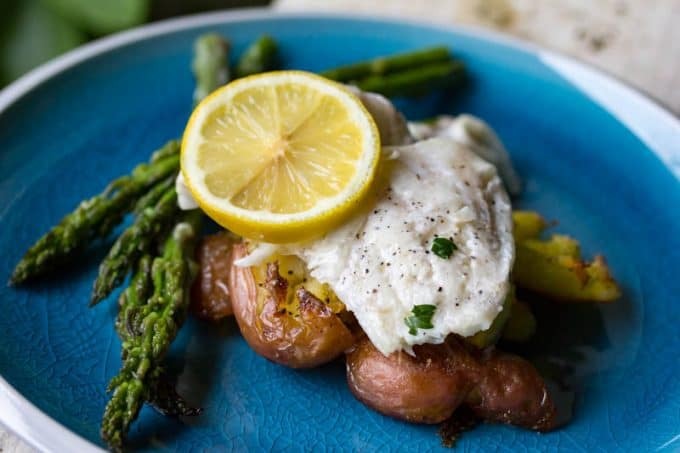 You'll never want walleye another way ever again. 1. Start up your grill on smoke with the lid open for 5 minutes, and then set the temperature to 400 degrees. Use the time it takes to preheat, (10-15 minutes) to prep the dish. 2. Start you prep by making sure your filets are completely dry. Use paper towels to soak up any excess water. 3. 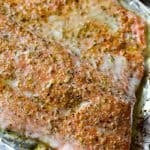 Add half of your salt and all of your pepper directly to the fish filets and lay them flat in a 9x9 ovenproof baking dish that has been coated with non-stick cooking spray. 4. In a small microwave safe bowl, add the other 1/2 teaspoon salt, cream, butter, lemon juice, garlic, scallions and leeks. Place the bowl in the microwave and cook on high for 1 minute, or just long enough to melt the butter. Remove the bowl from the microwave and lightly stir until everything is mixed well. 5. Pour all of the sauce over the top of the fish. 6. Slice your lemon and place 4-5 slices on top of the fish. 7. Place your baking dish on the pre-heated grill and let cook for 20 minutes. 8. Remove your fish from the grill and sprinkle the parsley onto the top of the fish. You can plate immediately. Use a large spoon to ladle some of the sauce directly onto your fish. this is amazing.thanks for sharing.